Electric Recliner Chairs on Cycloidal Vibration Therapy. 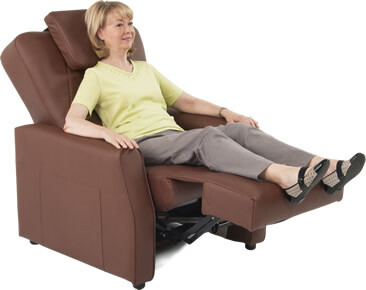 Electric recliner chairs are convenient additions to Cycloidal Vibration Therapy. These furniture pieces are designed to provide whole body treatment at the touch of a button. Therapy can be enjoyed in the upright position, with your feet up, or with your body fully reclined in the sleeping position. A non-invasive massage is employed by a special motor in electric recliner chairs to create vibrations, which bring numerous benefits. Scientific studies prove Cycloidal Vibration increases blood circulation. As blood flow is heightened, it is possible to prevent bed sores and other ailments caused by pressure and immobility. This therapy relaxes muscles as it penetrates deep tissues that are hard to reach with conventional message treatments. As you recline on an electric chair, you will receive CVT that will increase your flexibility and decrease lower back pain, especially in your hip flexors. If you suffer from multiple sclerosis or cerebral palsy, this therapy may relieve spasms so that you can enjoy a higher quality of life. The lymph system allows the body to drain away and filter harmful organisms. Many people suffer from lymphedema, a swelling of tissues caused by problems within this system. Cycloidal Vibration in a reclining chair stimulates light vessels within the lymph system and clears blockages. This alleviates stiffness and puffiness caused by extra fluid in the tissues. In patients with painful venous ulcers, studies report CVT and the use of compression bandages can accelerate wound recovery. Also, it can hasten recovery time with conditions like cellulitis, an infection in the lower limbs. Cycloidal Vibration is a revolutionary treatment used to boost circulation and heal the body. Using this therapy combined with an electric reclining chair will help you remain comfortable as you lower your musculoskeletal pain, increase your flexibility, decrease your swelling, and heighten your blood flow. This will keep you feeling better without the need for invasive procedures.